UPDATE: Over 25,000 supporters are expected to attend Saturday’s rally in Melbourne, Florida by President Donald Trump, according to Brevard County Republican Chairman Rick Lacey. Lacey spoke to WESH-TV Friday. WESH reported a large open field adjacent the tarmac and hanger is being prepped with jumbotrons to accommodate the massive crowd. More tickets have been released for the campaign style airport rally in Melbourne, Florida by President Donald Trump on Saturday. Free tickets for the rally were initially said to be ‘sold out’ but more space on the tarmac adjacent to the hangar where the rally will be held has been made available for supporters in order to meet “incredibly high demand”. The rally crowd is now planned to be larger than the massive crowd that attended then candidate Trump’s rally at the same location last September that saw thousands turned away. Saturday’s rally is being organized by the still active Trump campaign. Tickets for the President Trump rally can be obtained at this link. 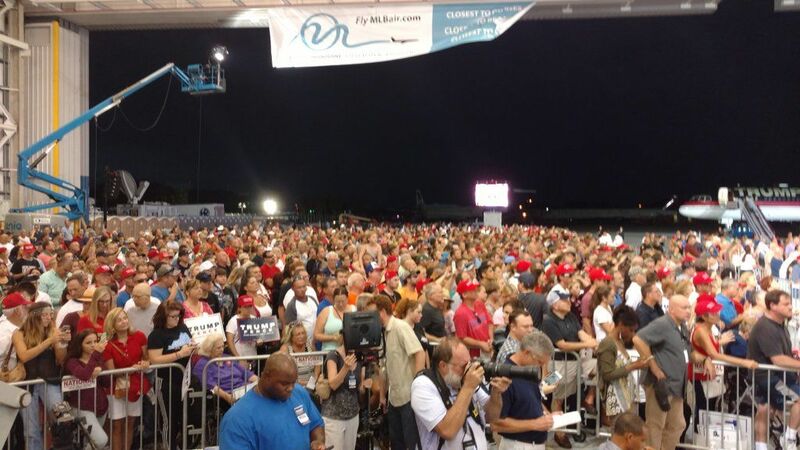 The rally is being held at the AeroMod International Hangar Orlando-Melbourne International Airport and is scheduled for 5 p.m. EST with doors opening at 3 p.m.
Cable channel News 13 in Central Florida reported on air that organizers are planning for a larger crowd than the September rally. Florida Today reported an airport official stated the expansion was made to meet “incredibly high demand for tickets” to see the president. Officials on Thursday expanded the area at Orlando Melbourne International Airport so more can attend Saturday’s “thank you” rally for President Donald Trump. Earlier Thursday officials said all the passes were distributed but that changed as more and more people requested them. “Since the original allocation of tickets was issued and depleted, an additional section was approved to accommodate more of the incredibly high demand for tickets,” said Lori Booker, a spokeswoman for Orlando Melbourne International. The City of Melbourne on Friday released parking and traffic plans for the rally. The city also announced protesters were granted a permitted area right across from the main street entrance to the rally site. The protest is expected to draw several hundred anti-Trump demonstrators. Link to Melbourne website where maps can be downloaded. Ticket holders are being advised to arrive early and bring disposable chairs and umbrellas for the long wait for admission. Chairs and umbrellas will not be allowed past the security checkpoint. Melbourne Police told The Gateway Pundit Friday night that shuttle bus service will only be available from the handicapped parking area on NASA Blvd. Florida Today reporter Dave Berman wrote up a Q and A about logistics for attending the rally.